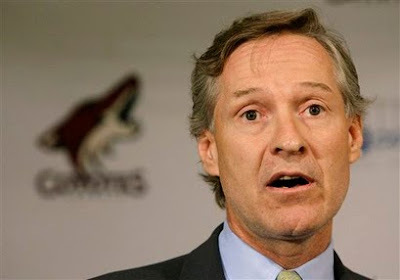 Hockey Plumber: Trade Deadline 2010: Busy Day for Phoenix? Really? Trade Deadline 2010: Busy Day for Phoenix? Really? The day was off to a slow start, but ended with a flourish of trades, many of them involved, of all teams, the Phoenix Coyotes. Altogether the day saw 30 trades, involved 53 players and 25 draft choices. The Coyotes were involved in seven transactions. Phoenix started off by acquiring defenseman Derek Morris from Boston in exchange for a 2011 4th round pick. Later they were involved in what could be categorized as the biggest trade of the day, adding forward Wojtek Wolski from Colorado in exchange for forwards Peter Mueller and Kevin Porter. The Coyotes also traded for blueliner Mathieu Schneider from Vancouver, send defenseman Sean Zimmerman and a conditional pick back to the Canucks. From Toronto they acquired forward Lee Stempniak for defenseman Matt Jones and a fourth and seventh rounder. They added forward Alexandre Picard from Columbus for forward Chad Kolarik, goaltender Miika Wiikman and a 2011 seventh rounder from the Rangers for defenseman Anders Eriksson and forward Petteri Nokelainen from Anaheim for unspecified sixth round pick. Back in July of last year, who would have speculated that Phoenix would be 2010's busiest BUYERS at the deadline? That this team was adding pieces in March is testament to the amazing job that the Coyotes coaching staff has done and to the spectacular fortitude that their core players have displayed despite all the question and controversy that surrounds the organization and their ownership issues. Phoenix added experience for the immediate playoff run and possibly the most talented young player exchanged today in Wolski. Bravo Don Maloney! I kinda liked Peter Mueller but Wolski has been great since the trade. Not sure if Derek Morris will do all that much for them. But yeah, last summer I partially expected them to be in Hamilton by now, so good for them for sticking around, playing well and shoring up for the playoffs.